Home » Tony’s Tips » Articles » Engines & Components » Which Way Does My Engine Turn? One will find that much of the confusion in the marine industry as to Right Hand / CW, or Left Hand/CCW rotation may have its roots based on the early definitions used by the Detroit Diesel Corporation (from just before WWII) in regards to the way they categorized their engines, AND in the way many in the AUTOMOTIVE Industry talk about engine rotation. Although engine rotation is defined in SAE J 824, let’s just say that because Detroit 2-stroke engines were so popular and universal in their base design, (the WW II standard 6-71 block was 100% symmetrical and could be “mirrored” or flipped around/reversed and the output power could be pulled from either end), Detroit seemed to always use the front end of the engine to describe rotation. Besides that, general “Automotive Lingo” told us that because you could only “see” the front of your car engine, car buffs would use the front of the engine ( the part that they could actually see turning) to describe engine rotation (Right Hand or CW), although car engines actually met the SAE standard of CCW rotation. Totally different than all other manufacturers of engines, air compressors, hydraulic components, etc., etc., etc.. In otherwords, everyone else views “rotation” by looking at the “business end” or “principal output end” of the engine or other appliance / component to describe “ROTATION” direction. 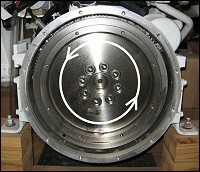 And COUNTER CLOCKWISE / “CCW”, is the standard of the industry from a Briggs & Stratton lawn mower engine (although the flywheel is actually opposite to the output end) to your VW, Lexus, or BMW, and every gasoline or diesel engine in general use today that may be applicable to vessel propulsion. To sum it up: Whether CCW (standard) or CW (opposite) rotation, it is always defined as the direction of rotation when looking at the flywheel or output end of the engine… See how simple that is!! As soon as we add a typical transmission behind the engine, the output of the transmission can be either the same or opposite of the engine’s flywheel – Hence a “reverse gear” or reduction gear. But not all reverse gears work the same. Years back, even though the Reverse Gear could change the output direction of the engine’s output rotation (make the boat go backwards), that does not mean it could transmit full power in either direction. Allison, Borg Warner, and many other reverse gears were only capable of transmitting the engine’s full power through one of the TWO sets of internal clutches, and those were called the FORWARD or MAIN CLUTCHES. So, with twin engine boats, opposite rotation engines were developed and the transmission oil pressure system/pump was reversed so it could operate with a CW or RH (non-standard rotation) engine, and use the forward clutch for a left hand prop. That’s why we had an Allison MH 20RH and a MH20LH. That’s why the BW gears have an oil pump on the front that can be rotated 180 degrees for a different input rotation. That’s why on the old Twin Disc MG 512, you could flip over the oil pump and make a transmission work with either input rotation. And that’s why a ZF220A has a different oil pump than a ZF220V – Input rotation of the input shaft and/or oil pump direction is opposite. To understand the transmission a tad more, you have to look at it’s basic design what’s going on inside as to the POWER FLOW through the gears. In most cases you are dealing with a 3-shaft drop gear (typical ZF63/63A, ZF 220/220A, Twin Disc 5061/5061A , MG 509, MG 514 , MG5114A, etc. – Down angle or not doesn’t matter as they are still all 3-shaft transmissions, and the power flow through the transmission is all the same – The power comes into the input shaft and it is always turning the same way (it’s connected to the engine flywheel through a torsional coupling) – From there the power either goes directly to the output shaft through 1 pair of meshing gears so now you have the output shaft of the transmission rotating opposite the engine, and with a standard rotation engine (CCW), you would use a RIGHT HAND prop to move the vessel forward, or for reverse output rotation, the power goes from the input shaft to the “lay” or 3rd shaft, and now the output shaft of the transmission is the same as the engine output; hence, you use a LH prop to go forward – REMEMBER, we are always looking from the rear of the engine (or boat) towards the bow or front of the engine when discussing ROTATION, and that applies to props turning inboard or outboard. Just visualize looking through the boat and seeing the engines flywheel (it’s turning CCW in a standard rotation engine). Now let’s look at a modern coaxial-type gear similar to a MG506, MG 507, or a ZF 301 or ZF 304. Again, down angle or not doesn’t matter, as the power flow through the gear is the same. Coaxial style refers to transmissions when the engine’s crankshaft and transmission output shaft are generally in the same plane with no, or very little, drop or offset between them. In a coaxial-type transmission, you have, what I call, a 4-shaft transmission. The power flow is always from the input to the output shaft but through two or 3 pairs of meshing gears to get either rotation of the output shaft. The transmission has TWO lay shafts, per se, instead of just one. Now that you have this fixed in your mind, ponder these questions – all based upon engine torquing rotation or how it tends to roll or twist over in the boat under power. Which direction does the engine twist when in gear with a standard inline drive? Does it matter if the engine is in forward or reverse? ANSWER: With a convention in-line drive, the engine will always twist opposite the direction that the prop is turning when in gear, be it FORWARD or REVERSE. Looking again, from the back of the vessel, as though the boat were “see-through” and using a RH prop, the engine will rotate or TWIST CCW when in FORWARD. It will twist CW when in REVERSE. Which direction does the engine twist when not in gear and the engine is accelerated quickly? ANSWER: When the engine is in neutral, basically the only load it can see is when the engine is revved up quickly (caused by the accelerating inertial of the internal components). Again look from the back of the engine, since the engine ALWAYS spins CCW, then during this rapid “rev-up” the engine will twist momentarily to the right and then remain steady when the RPM’s are steady. Which direction does the engine twist when connected to a close couple V-drive in both forward and reverse? ANSWER: You do not need to know what is going on inside the Close-Coupled V-drive, you only need to visualize what is happening by “seeing through” the boat. Both the engine and V-Drive are “ONE” (they are coupled together), so the engine / v-drive “unit” will twist opposite to the load (the PROP). An RH prop in FWD, the “unit” will twist CCW, in a similar fashion to a conventional drive with ONE caveat. Because of the much larger offset in-between the crankshaft and the propeller shaft along with a built-in angle between the propeller shaft and the engines crankshaft of usually greater than 12 degrees, this twisting will be “leveraged” to some extent that will typically require a more stout foundation for these types of drive-trains to control this movement. Which direction does the engine twist when connected to a REMOTE mounted V-drive in both forward & reverse? In this case I am talking about a V-drive that has its own internal reverse, or is integral to it, similar to a ZF 220V or a Twin Disc MG5114RV. ANSWER: With a REMOTE V-Drive, you have a totally different engine reaction, as now, the engine “sees” only the input shaft to the remote mount V-drive (or any remote type of transmission or power absorbing device). The “V” has absolutely nothing do with this part of the question. So, the engine now twists opposite (CW) to its rotating crankshaft (unless the engine has a reverse gear on it before the V- drive similar to a “Walters” unit) regardless of what the “V-Drive” (or other remote mounted device) is doing. The cardan, or U-joint, shaft is what changes it all because it never changes direction. In a car and your boat, the “absorbing shaft” does change direction. Which direction does the engine twist when connected to a REMOTE mounted in-line drive or traditional type reverse gear in both forward & reverse? Believe it or not, although not common, regular type transmissions are remotely mounted away from the engine in some applications. ANSWER: An in-line “remote” reverse gear has a simple answer – Exactly like the remote V-Drive above – The engine will always twist CW when put under load whether the transmission is in FORWARD or REVERSE. Is engine twist or torque rotation affected by the internal design of the transmission as to whether it’s a 3 or 4 shaft transmission? ANSWER: The internal design of the transmission has nothing to do with which direction the engine will tend to twist. When a reversing transmission is attached or “close-coupled” to the engine (they are an integral unit), you can think of the output shaft of the transmission as the CRANKSHAFT, and the engine will twist opposite to what that output shaft or coupling “sees” loadwise or when the trans is in-gear, be it forward or reverse. What is happening to the “remote” V-drive or remote in-line transmission when in forward or reverse? 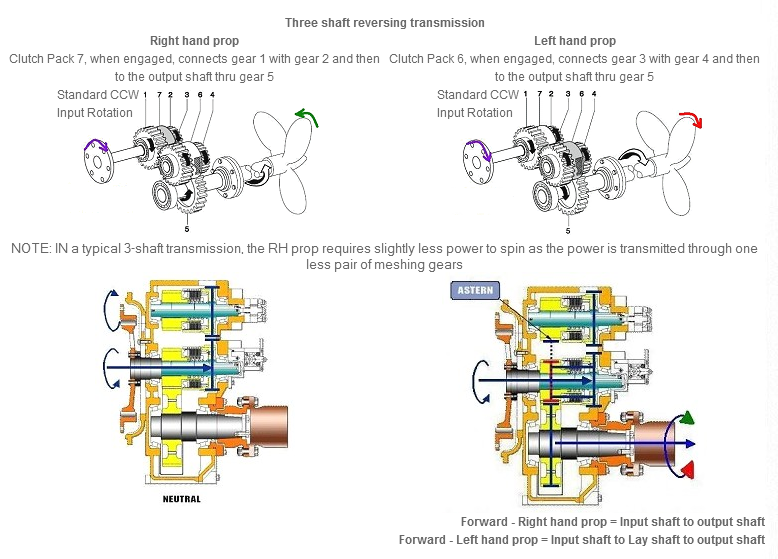 ANSWER: Twisting torque on the a remote V-drive or remote in-line transmission will be opposite to propeller rotation but will be reduced in one direction and increased in the other as the input shaft torque direction is always the same. Calculating exactly what these “twists” would be could be very tricky. Understanding the general concept of what they are is easy. Additional “remote loads” can be or are fwd/rev thrust, and fore/aft rotation which is opposite/90 degrees to the propeller torque axis, but this is all dependent upon mount design, gear ratios, etc, etc… Also “down angles” add a new dimension to it all. Gets very complex and that is the biggest reason why a remote mounted V-Drive requires engineering expertise for the installation to be long term reliable. Ever heard of the “V-Drive stigma”? And the toughest of them all, if you like scratching your head – Think about engine twist in a car with a conventional front engine and rear-wheel drive in both forward and reverse. Then add some flavor and ponder that with front wheel drive. ANSWER: No answer from me on this one as we all need to feed our brain.